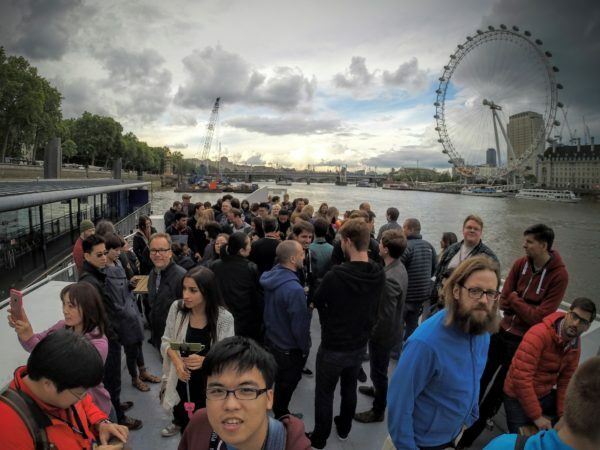 As you may have heard, Mozilla met up this June in London for an all-hands-on-deck work week. This was a great opportunity for us to work face-to-face and across different teams, to share ideas and even hack on some code. Below are only a few highlights, but you can expect more updates in the weeks to come as we dive deeper into sharing our progress and look to you for some help. Connected Devices team took a cruise on the River Thames. Ari and team gave an update on the latest plans including an overview of the Connected Devices team strategy. In short, the plan is to still pitch and innovate on product ideas that create compelling user experiences; they should solve real problems, connect us with others, or provide entertainment. The longer game is to turn the projects with traction into products, that will give us the focus we need to build out the supporting platforms and integrations into essential services. Eventually, we’ll make these platforms available to developers and partners so they can create their own “powered by Mozilla” products with platforms that are open, interoperable and advocate user privacy. Formerly Project SmartHome, the Project Haiku team shared their story about how the project pivoted away from home automation and, as of late, is exploring themes around connecting people and non-intrusive communication. This has all been done through developing hypotheses, creating simple prototypes, and putting them in front of real users. You can expect a more detailed update on what the team is up to soon. While much of this team’s focus has been PM2.5 air quality sensors in Taipei, a trip to London was a great opportunity to place sensors at sites near our meetings. Three London-based sensors gathered readings all week, and populated data visualizations at sensorweb.io. If you’re interested in building and setting up your own sensor at home, you can get instructions here, but everyone can look forward to more ways to participate in this project soon. As one of the newer projects, it was great to see the rapid progress the Project Magnet team has already made. Prior to leaving for London, the team distributed Magnet server and mobile app binaries, allowing participants to take advantage of this broadcaster-to-consumer usecase in the wild. The team was able to gather loads of insights, and even discuss some potential collaboration with other teams and their mobile app usecases. Of course, Project Link and Project Vaani made some headway, which we’ll talk about soon in some dedicated posts, along with some of the other projects and ideas in the queue. Check back here for the latest updates, or if you want to subscribe for email updates, sign up here.